The Vietnamese New Year – Tet Nguyen Dan – follows the same lunar calendar that governs Chinese New Year celebrations worldwide. So on the same day, the world celebrates Chinese New Year, the people of Vietnam celebrate Tet. The Vietnamese consider Tet to be the most important one in their considerable festival lineup. Family members gather in their hometowns, traveling from across the country (or the world) to spend the Tet holidays in each other's company. Contrary to popular belief, foreign visitors can and do join in the Tet fun. In the next few chapters, we explain the significance of the holiday, places that throw the best Tet parties, and survival tips for Tet visitors. Tet Nguyen Dan translates literally to "the first morning of the first day of the new year". Long before Tet, Vietnamese try to get rid of any "bad fortune" by cleaning their homes, buying new clothes, resolving disputes, and paying their debts. Paying their respects. Like the Chinese, the Vietnamese believe that Tet marks the time when the Kitchen God reports on their family to the Jade Emperor. Family members attempt to propitiate the Kitchen God by burning gold leaf paper and offering carp (live, placed in a bucket of water upon the family altar) for him to ride. Vietnamese also pay tribute to their ancestors throughout Tet. Each mid-day, for the duration of the New Year week, offerings are placed on the household altar and incense is burned in memory of the departed. Courting Lady Luck. On the stroke of midnight, as the old year turns into the new, Vietnamese usher out the old year and welcome the new Kitchen God, beating drums and lighting firecrackers. The Vietnamese believe that one's luck in the entire year can be determined by auspicious (and not-so-auspicious) events during Tet. Thus Vietnamese will try to even the odds. Barking dogs inspire confidence in the New Year, so dogs are encouraged to bark. Hooting owls are regarded as an unlucky omen. The wealth of the first person through the door on New Year reflects the family's luck for the year to come, so the rich and popular are invited to one's home. Visiting family and friends. On Tet, families lay out a splendid feast to welcome visiting relatives and friends. Family members and friends also exchange gifts during the visit. After the guests have been feted, the family goes off to their respective places of worship (Christian or Buddhist) to pray for the year to come, or join in the many public parades celebrating the festival. The first few days of Tet are meant to be spent visiting friends and relatives. The first day is spent calling upon close friends and one's parents. The next day, Vietnamese call on their in-laws and other friends. And on the third day, people call upon their distant relations. 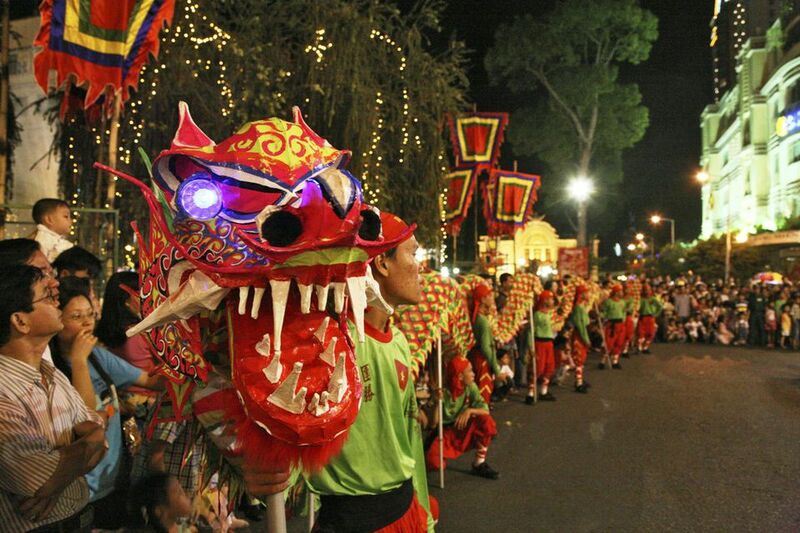 Tet officially ends on the seventh day, marked by dragon processions stalking the streets. Tet is a great time to see Vietnam at its most colorful, especially in the cities of Hue, Hanoi, and Ho Chi Minh City. However, reservations are bound to be filled up long before the actual holiday, and transportation before and after Tet is bound to be sketchy at best (everybody wants to be home for Tet!). Also, many tourist spots are closed for several days between Tet. Do visit if you intend to stay in one place for the duration of Tet, and can commit to letting the Tet travel rush die down. Expect prices to be jacked up to the maximum throughout the Tet holiday. Don't take it personally; everyone else is paying more, too. The Vietnamese capital is the best place to see traditional Tet celebrations taking place, all taking place between the second and seventh day of the festival week. At the stroke of midnight on Tet eve, fireworks shows will go off at five key areas across Hanoi: Thong Nhat Park, Van Quan Lake, Lac Long Quan Flower Garden, My Dinh Stadium and Hoan Kiem Lake. On the fifth day of the Lunar Month, Hanoi citizens flock to Dong Da Hill southwest of the capital to celebrate Dong Da Festival, which commemorates a victory over invading Chinese forces (the hills in the area are actually burial mounds, covering the remains of over 200,000 Chinese soldiers buried on the battlefield). On the sixth day, the Co Loa Citadel to Hanoi's north sees costumed locals forming a procession, much as their ancestors did long ago, in the Co Loa Festival. Nowadays, civilians march in the parade, instead of the former military officials and government mandarins. Finally, a calligraphy festival takes place all throughout Tet on the grounds of the Temple of Literature in old Hanoi. Calligraphers called ong do set up shop in about a hundred booths, brush in hand, writing auspicious Chinese characters for paying customers. The Hue imperial citadel, located in the former royal capital of Hue, has seen a renaissance of royal-era traditions. The most significant is the raising of the cay neu, or Tet pole, on the palace grounds. The cay neu repeats itself as a traditional bamboo plant in millions of Vietnamese homes, but the one in the Hue citadel is the biggest and flashiest. The first cay neu was traditionally first set up by the Buddha to drive away evil monsters. An elaborate ceremony raises the Tet pole on the first day of the holiday. The process is repeated on the seventh and the last day, marking the end of Tet. In olden times, Hue residents would take their cue from the palace ceremonies to set up and take down their own cay neu at home. The mass of motorcycles jamming Ho Chi Minh City doesn't go away during Tet, but parts of the city explode in color during the week-long festival. On the eve of Tet upon the stroke of midnight, fireworks shows will ignite at six areas across the city: Thu Thiem Tunnel between districts 1 and 2, Dam Sen Park in District 11, Cu Chi Tunnels in Cu Chi District, Rung Sac Square in Can Gio District, Lang Le-Bau Co historical site in Binh Chanh District, and the Nga Ba Giong Memorial in Hoc Mon District. In District 8, Tau Hu Canal becomes the site of a flower market, with blossoms and ornamental trees sourced from the nearby provinces of Tien Giang and Ben Tre. The market's wares vary wildly, from cheap cockscomb flowers in pots to expensive yellow apricot trees. In District 1, a book festival takes place from the first to the fourth day of Tet along the streets of Mac Thi Buoi, Nguyen Hue and Ngo Duc Ke. Thousands of books and magazines will change hands during the festival. In District 5, Cholon (Vietnam's traditional “Chinatown”) offers both color and flavor in excess; as you admire the flowers and decorations adorning the area's temples, take a chance on local, Tet only foods like banh Tet (a cake made of steamed rice, mung-bean and pork) and Xoi (colored sticky rice cakes).